Are sanctions capable of derailing Tehran's nuclear drive? Some skeptics reject such measures altogether, preferring to deal with Tehran by either accommodation or containment. Others point to the spotty historical record of sanctions in altering state behavior in arguing that they will similarly fall short of forcing the ayatollahs to rethink their long-standing nuclear ambitions. For example, sanctions were found to be successful in only a third of the 105 instances in which they were applied between World War I and the end of the Cold War. As the past year has shown, however, Tehran may well turn out to be the exception to the rule—but only if the Obama administration (and Western governments more generally) make swift and skillful use of the economic and strategic means at their disposal. Stuxnet, a mysterious computer worm—believed to have been created by Israel, the United States, or both—wreaked havoc on Iran's nuclear control systems. Between 2009 and 2010, Stuxnet is believed to have disabled close to 1,000 of the existing 9,000 uranium enrichment centrifuges at the Natanz facility in central Iran, thereby effecting at least a temporary slowdown of Iran's nuclear cycle. In June 2010, citing Iran's ongoing intransigence over its nuclear program, the United Nations Security Council authorized a fourth round of sanctions that significantly expanded economic penalties and restrictions on Tehran. It was followed just weeks later by congressional passage of the U.S. Comprehensive Iran Sanctions Accountability and Divestment Act, a sweeping set of new provisions aimed in large measure at throttling the Iranian regime's oil sector. These measures—together with ancillary steps adopted by U.S. allies in Europe and Asia—have helped considerably ratchet up the costs to Iran's leaders of their nuclear endeavor. Iran's gasoline imports, for example, have declined precipitously, a product of skittish foreign companies pulling back their shipments to the Islamic Republic. To mitigate the effects of this slump, the Iranian regime has been forced to ramp up its domestic refining capacity and eliminate costly subsidies on refined petroleum—at considerable economic and political cost. Iran's oil exports likewise have been affected as international restrictions have progressively squeezed the ability of the world's fourth-largest oil exporter to bring its crude to international markets. Most recently, Iran's national shipping line, IRISL, is said to be encountering significant problems as a result of U.S.-led economic pressure from bank foreclosures on many of its 170 vessels to difficulties in obtaining the necessary insurance to underwrite the voyages of the others. The impact of this economic pressure has been augmented by a series of asymmetric initiatives. Chief among these is Stuxnet, the mysterious software—believed to have been created by Israel, the United States, or both—which has wreaked havoc on Iran's nuclear control systems since the summer of 2009. According to the Institute for Science and International Security, between 2009 and 2010, Stuxnet succeeded in disabling close to 1,000 of the existing 9,000 uranium enrichment centrifuges at the Natanz facility in central Iran, thereby effecting at least a temporary slowdown of Iran's nuclear cycle. At the same time, covert action has had an impact on the human element of Tehran's nuclear endeavor. The late-November assassination of one nuclear scientist and the wounding of another in separate attacks in Tehran are but the latest signs of what the media has come to call "the covert war against Iran's nuclear program." Collectively, these measures are believed to have retarded Iran's path to a nuclear weapon, perhaps significantly so. As a result, U.S. officials now believe that the international community has gained "a little bit of space" to confront Iran. "The most recent analysis is that the sanctions have been working," U.S. secretary of state Hillary Clinton told a television talk show in the United Arab Emirates in mid-January. "They have made it much more difficult for Iran to pursue its nuclear ambitions." Yet, in spite of these successes, the available evidence suggests that international sanctions have so far fallen short of substantively altering Iran's strategic calculus. To do so, Washington will need to amplify its existing pressure on the Iranian regime through the exploitation of new economic and strategic "entry points." Fortunately, a number of those exist. In October 2007, the Bush administration designated Iran's Islamic Revolutionary Guard Corps (IRGC) as a "specially designated global terrorist" under U.S. law. The move was historic: This was only the second time Washington had blacklisted the elite military of another nation. (The first took place during World War II when the Roosevelt administration explicitly targeted Hitler's Waffen SS.) It was also potentially far-reaching; the designation provided Washington with the authority to target the various companies and commercial entities controlled by the IRGC and to begin to exclude them systematically from international markets. So far, however, comparatively little has been done on that score. While some sanctions have been levied by the U.S. Treasury Department against IRGC-owned businesses, interests, and personnel, these restrictions are still far from comprehensive. Nor does the current administration seem to possess an authoritative picture of the IRGC's global economic presence. By all indications, the scope of that footprint is immense. In recent years, the IRGC has emerged as a major economic force within the Islamic Republic, in command of numerous construction, industrial, transportation, and energy projects as well as various commercial enterprises, valued in the billions of dollars. When tallied in 2007, it was estimated to have a cumulative net worth of some $12 billion. Additional commercial deals since have expanded this empire still further. This economic ascendance has been reinforced by preferential treatment from the Iranian president. Himself a former Guardsman, Mahmoud Ahmadinejad wasted no time funneling massive amounts of commercial business and allotting preferential government posts to his onetime comrades-in-arms upon taking office in 2005, with far-reaching effects. Two years into Ahmadinejad's first term, fourteen of Iran's twenty-one cabinet posts were occupied by members of the IRGC while former Guardsmen and their fellow travelers made up more than a fifth of the seats in the majles, Iran's unicameral parliament. The aggregate result of this trend, which has only intensified over time, has been a "creeping coup d'état" in which Iran's clerical elite, long the economic center of gravity within the Islamic Republic, has gradually been eclipsed by its own ideological muscle. Policymakers in Washington have become increasingly aware of this fact. In September 2010, Secretary of State Clinton, in a speech before the Council on Foreign Relations, described Iran's transformation into "a military dictatorship with a … sort of religious-ideological veneer." Yet this recognition has not translated into a meaningful change in how the administration applies pressure on the Islamic Republic. While sanctions against Iranian entities, many of them IRGC concerns, continue apace, U.S. officials have not yet outlined the width and breadth of the IRGC's economic empire—or moved creatively against it. Washington certainly has the ability to do so. A case in point is Khatam al-Anbiya, the construction arm of the Revolutionary Guards. A massive conglomerate of over 800 companies, it casts a long shadow over economic commerce within the Islamic Republic. As Mark Dubowitz and Emanuele Ottolenghi of the Foundation for Defense of Democracies have detailed, Khatam al-Anbiya's subsidiaries "collectively employ around 40,000 people and have won approximately 1,700 government contracts, including billions of dollars in energy-related contracts awarded without a competitive bidding process." This, in turn, means that foreign companies doing business in Iran are more likely than not to find the IRGC as their economic partner. The U.S. Treasury Department has attempted to flag these risks for international investors, sanctioning a series of Khatam al-Anbiya's affiliates over the past two years in order to "help firms worldwide avoid business that ultimately benefits the IRGC and its dangerous activities." But it has not yet penalized multinationals that knowingly engage in commerce with the IRGC. Nor has it taken serious aim at the overseas activities of the IRGC itself—even when those activities have a direct impact on U.S. national security interests. In Iraq, for example, U.S. officials estimate that one of the largest economic players in post-conflict reconstruction is none other than Khatam al-Anbiya. That state of affairs makes the IRGC a key (if silent) partner in Iraq's post-Saddam economy and politics—one with considerable power to steer the country into Tehran's geopolitical orbit. And yet, despite the billions of dollars already committed to the reconstruction of Iraqi infrastructure, concerted measures have not been taken to prevent U.S. taxpayer expenditures from becoming Tehran's gain. They should be. Increasingly, the economic fate of the IRGC is intimately intertwined with that of the Islamic Republic itself. Mapping the IRGC's financial empire and then limiting its fiscal freedom of action are, therefore, critical points of leverage for the West in addressing Iranian behavior. In December 2009, a confidential report obtained by the Associated Press shed light on a hitherto unexplored dimension of Tehran's nuclear edifice. 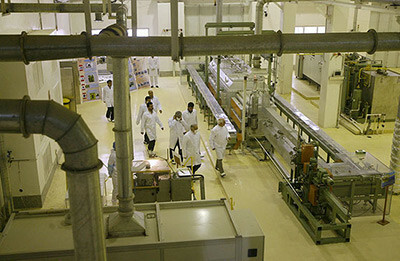 The study, prepared by a member state of the U.N.'s nuclear watchdog, the International Atomic Energy Agency (IAEA), detailed Iran's expanding global quest for the raw material necessary to keep its nuclear program afloat. As part of that effort, the report said, Tehran was close to finalizing a deal with Kazakhstan to "clandestinely import 1,350 tons of uranium ore" from the Central Asian state at a cost of $450 million. The report laid bare what amounts to a major chink in the Islamic Republic's nuclear armor. For all of its atomic bluster, the Iranian regime lacks enough of the critical raw material necessary to acquire independently a nuclear capability. Indeed, nonproliferation experts believe Iran's known uranium ore reserves to be "limited and mostly of poor quality." As a result, Tehran desperately needs sufficient, steady supplies of uranium ore from abroad. Without them, its nuclear plans would—quite simply—grind to a halt. This vulnerability, moreover, is deepening. In the spring of 2010, an exposé in Time magazine noted that Iran's aging uranium stockpile—acquired from South Africa in the 1970s—had been mostly depleted. This reality, nuclear experts say, goes a long way toward explaining why Tehran has sought to expand its partnership with the government of Robert Mugabe in Zimbabwe, a major uranium ore repository, over the past year. It also plays a role in Iran's expanding strategic relationship with Venezuela; with the blessing of the Hugo Chavez regime in Caracas, Iran is believed currently to be mining in Venezuela's Roraima Basin, which may house the world's second largest deposit of uranium ore. Yet by themselves, these sources do not appear to be sufficient to feed Tehran's uranium habit. This February, a new intelligence summary from an unnamed IAEA member state reaffirmed that the Islamic Republic continues to search extensively for new and stable sources of uranium to fuel its nuclear program. In particular, Iran has focused on Africa—home to a number of key uranium producers including Zimbabwe, Senegal, Nigeria, and the Democratic People's Republic of Congo—as a key future source for its uranium imports. Tehran's procurement patterns underscore a major window of opportunity for the West. Over the past three years, Western chancelleries have marshaled considerable diplomatic efforts to dissuade potential uranium suppliers such as Kazakhstan, Uzbekistan, and Brazil from providing Tehran the requisite raw material for its nuclear program. For all their concern, however, policymakers in Washington have not yet given serious thought to penalizing countries for their uranium sales to Iran—or crafted a legislative framework that makes it possible to do so. They should; by identifying and then punishing Tehran's current uranium ore suppliers, the international community can hamper the regime's acquisition of the raw material necessary to realize its nuclear ambitions. Punitive measures can also send a strong signal to prospective uranium sources that their involvement with the Islamic Republic's nuclear program will come at a steep economic and political cost. The past two years have witnessed a significant, albeit largely unnoticed, evolution in U.S. policy toward Iran. Early on in its tenure, the Obama administration—hopeful of reaching a negotiated settlement over Iran's nuclear program—consciously chose to break with its predecessor's tough stance in favor of engagement with the Iranian leaders. This led the White House to de-emphasize systematically its democracy promotion efforts toward Iran and to remain silent when Ahmadinejad's fraudulent reelection galvanized widespread protests against the Islamist regime. Over time, however, as the prospects for meaningful engagement have faded, the administration has gravitated toward a greater focus on the Iranian street. This shift was encapsulated in its 2011 Persian new year message, in which President Obama told the Iranian people in no uncertain terms that he supported their "freedom of peaceful assembly and association; the ability to speak your mind and choose your leaders." Washington's renewed focus on human rights in Iran has been mirrored at the international level. In late March, the United Nations Human Rights Council approved the establishment of a special rapporteur to monitor Tehran's violations of human rights and report on them to the council and U.N. General Assembly. This move, which reinstated international monitoring of Iran's domestic environment for the first time since 2002, came in response to deteriorating conditions within Iran. The Islamic Republic is now estimated to execute more people per capita than any other country in the world. More than 1,250 political activists have been arrested over the past year for participating in protests against the regime. And a recent report by human rights watchdog Amnesty International highlighted the regime's increasingly draconian treatment of religious minorities such as the Baha'is, in violation of international norms. Cumulatively, these developments lay the groundwork for Washington and its allies to make human rights an issue in their dealings with the Islamic Republic. They can do so in at least two concrete ways. The first is diplomatic. New international data on the depths of Iran's repression can serve as a lever to generate new legislation from the U.S. Congress that helps constrain the way the Islamic Republic deals with its captive population. Such initiatives have been considered in the past but with little success. There is reason to believe, however, that greater international attention to Tehran's internal conduct could translate into a more receptive audience on Capitol Hill for sanctions that specifically target Iranian human rights violations—and for greater oversight of U.S. policy to ensure that the disparate parts of the government work in tandem on the goals of human rights and democracy in Iran. Washington and foreign capitals can also highlight their opposition to Tehran's domestic conduct through an array of other measures, ranging from the symbolic—such as the cessation of regular travel to Iran by foreign diplomats, and calls for the release of prominent political prisoners as part of official diplomatic parlays—to the concrete, including travel bans on Iranian officials implicated in human rights abuses and fines levied against companies that sell Iran equipment later used for domestic repression. The second method by which Washington and its international partners can harness human rights is economic. There is considerable evidence that Tehran's internal behavior can be significantly influenced by external trade, much the same way the Soviet Union's was during the latter half of the Cold War. Here, the Europeans have noteworthy leverage even if Washington does not. The twenty-seven countries of the European Union cumulatively serve as Iran's largest trading partner, and even partial interruptions to Iran-EU trade could have a catastrophic effect on the Islamic Republic's economic fortunes. To date, however, European countries—despite their worries about Iran's nuclear progress—have been reluctant to roll back their financial dealings with Tehran. Human rights, however, could succeed where strategic concerns have not; Washington's allies in Europe have historically paid considerable attention to human rights and humanitarian issues on the continent and beyond. They are likely, therefore, to be receptive to U.S. pressure to condition their trade relations with Iran on an amelioration of human rights conditions inside the Islamic Republic. Moreover, the 1975 Helsinki Final Act—to which practically all European states are signatories—provides a legal basis for scaling back trade with countries that do not allow "the effective exercise of civil, political, social, cultural, and other rights and freedoms." Given this backdrop, limiting trade ties on human rights grounds would simply be a matter of honoring existing international commitments on the part of Tehran's European partners. By exploiting these vulnerabilities, Washington has the ability to achieve far greater momentum in its targeting of Tehran. Just as easily, however, sanctions could become a victim of their own success. Today, there is a growing—and dangerous—sense of inertia in Washington. In view of the successes of Stuxnet and economic sanctions, the Obama administration has increasingly adopted a wait-and-see approach to further pressure. In private and public forums in recent months, administration officials have tried to discourage new or complementary sanctions, arguing that existing measures need to be given a chance to work. By doing so, however, Washington risks losing its window of opportunity for altering Tehran's nuclear trajectory. Nor is success assured. At the end of the day, economic pressure alone could well be insufficient to change Tehran's strategic calculus. The Iranian regime may simply be too committed to its nuclear course to be deterred by nonviolent measures. What is evident, however, is that Washington and its allies in the international community have considerable additional leverage that they can bring to bear in their effort to derail the Islamic Republic's drive toward nuclear status. They will need to use it, and soon. French president Nicolas Sarkozy said as much back in January when he argued publicly that the Western nations "must reinforce the sanctions" they have passed to date. Sarkozy's counsel is worth heeding. If they hope to successfully thwart the nuclear ambitions of the Iranian regime, Washington and European capitals will need to be as creative, and as persistent, in preventing Iran's nuclear progress as their adversary in Tehran has been in pursuing the bomb. Ilan Berman is vice president of the American Foreign Policy Council in Washington, D.C.
 See, for example, Robert Baer, The Devil We Know: Dealing with the New Iranian Superpower (New York: Crown, 2008), and James Lindsay and Ray Takeyh, "After Iran Gets the Bomb," Foreign Affairs, Mar./Apr. 2010. See, for example, Yagil Henkin, "Why Economic Sanctions Alone Won't Work," Adelson Institute for Strategic Studies, On Second Thought, Oct. 22, 2009. Kimberly Ann Elliot, "Factors Affecting the Success of Sanctions," in David Cortright and George A. Lopez, eds. Economic Sanctions: Peacebuilding or Panacea in a Post-Cold War World? (Boulder: Westview Press, 1995), p. 53. "Non-proliferation," U.N. Security Council resolution 1929, New York, June 9, 2010. Comprehensive Iran Sanctions, Accountability and Divestment Act of 2010, U.S. House of Representatives resolution 2194, Jan. 5, 2010. Bloomberg Business Week (New York), Aug. 2, 2010; Financial Times, Aug. 11, 2010. Financial Times, Sept. 13, 2010. The Diplomat (Tokyo), Mar. 27, 2011. David Albright, Paul Brennan, and Christina Walrond, "Stuxnet Malware and Natanz: Update of ISIS December 22, 2010 Report," ISIS Report, Institute for Science and International Security, Washington, D.C., Feb. 15, 2011. The Wall Street Journal, Jan. 8, 2011. As cited in David Ignatius, "Buying Time with Iran," The Washington Post, Jan. 9, 2011. The Wall Street Journal, Jan. 10, 2011. Press TV (Tehran), Mar. 25, 2011. "Fact-Sheet: Designation of Iranian Entities and Individuals for Proliferation Activities and Support for Terrorism," U.S. Department of the Treasury, Washington, D.C., Oct. 25, 2007. Mehdi Khalaji, "Iran's Revolutionary Guard Corps, Inc.," Policywatch, no. 1273, The Washington Institute for Near East Policy, Washington, D.C., Aug. 17, 2007. Los Angeles Times, Aug. 26, 2007. Ali Alfoneh, "All Ahmadinejad's Men," Middle East Quarterly, Spring 2011, pp. 79-84. Amir Taheri, "The Odd Guard," The New York Post, Aug. 29, 2007. Mark Dubowitz and Emanuele Ottolenghi, "The Dangers of Doing Business with Iran's Revolutionary Guards," Forbes, June 15, 2010. "Sanctions against Islamic Revolutionary Guard Corps Affiliates," U.S. Department of the Treasury, Washington, D.C., Feb. 10, 2010. Author's conversations with U.S. officials, Washington, D.C., summer/fall 2010. USA Today, Mar. 22, 2010. CBS News, Feb. 24, 2011; Associated Press, Feb. 24, 2011. MSNBC, Dec. 29, 2009; Associated Press, Dec. 29, 2009. USA Today, Feb. 24, 2011; Associated Press, Feb 24, 2011. The Wall Street Journal, Dec. 15, 2009. USA Today, Feb. 24, 2011. The Sunday Times (London), Jan. 24, 2009. Ilan Berman, "How to Support the Struggle for Iran's Soul," Middle East Quarterly, Spring 2010, pp. 53-61. "President Obama's Nowruz Message," White House Blog, Washington, D.C., Mar. 20, 2011. "Rights Monitor on Iran Approved," VOA News, Mar. 28, 2011. VOA News, Mar. 2, 2011. Radio Free Europe/Radio Liberty, Mar. 23, 2011. Agence France-Presse, Mar. 31, 2011. "Trade, Countries, Iran," European Commission, Brussels, accessed Apr. 11, 2011. Final Act, Conference on Security and Cooperation in Europe, Helsinki, Aug. 1, 1975. Author's conversations with executive branch officials, Washington, D.C., Jan. 2011. Press TV, Jan. 24, 2011. Related Topics: Iran | Ilan Berman | Summer 2011 MEQ receive the latest by email: subscribe to the free mef mailing list This text may be reposted or forwarded so long as it is presented as an integral whole with complete and accurate information provided about its author, date, place of publication, and original URL.